This week I met Seb Schmoller who recommended that I have a look at the ocTEL MOOC , a 10 week open course in technology enhanced learning which is being run by ALT (Association for Learning Technology) here in the UK. Seb is a former Chief Executive of ALT. I was vaguely aware of this MOOC, but had put it to the back of my mind, because for me there are just too many MOOCs about at the moment – it’s difficult to know where to focus. But Seb’s prompt made me have another look and ‘Yes’ ocTEL does seem well organized with some interesting discussions and useful resources. However, I don’t think I will be getting fully engaged as I am already committed in part to FSLT13 due to start on May 8th 2013 – and Growing Old Around the Globe due to start on June 10th 2013. More of them later in other posts. So far in the ocTEL MOOC I have checked out the Week 1 resources and listened to the recorded presentations . One slide from Liz Masterman’s presentation has stuck in my mind. Liz Masterman interviewed academics in Higher Ed and asked them which theories informed their use of technology in their teaching. This Wordle is the result. 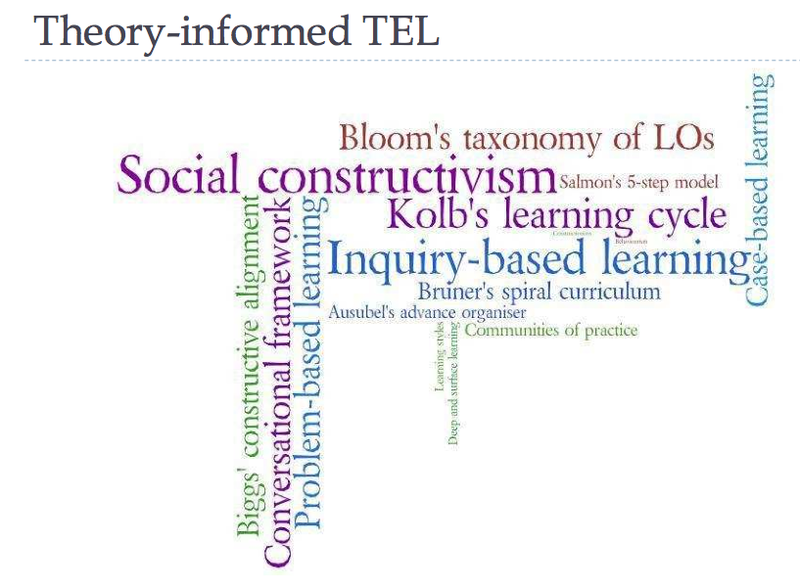 The two tiny words are ‘constructionism’ and ‘behaviourism’. This slide resonates with me because I was recently asked to create a presentation about learning theories for Lisa Lane’s Pedagogy First Online Teaching course. Whilst I am familiar with everything that is on Liz Masterman’s slide (although there are some models in there as well as theories), I only mentioned a few of these in my own presentation. Maybe I should have tried to take a broader brush, but at the time less seemed more. For me an omission from Liz’s slide and therefore from the interviewees’ thinking and experience of technology enhanced learning in Higher Ed is ‘Connectivism’ or anything to do with networked learning – although communities of practice can be thought of in terms of networked learning. In terms of the slide I don’t think it matters whether or not we think of Connectivism as a theory, since some of the other items listed on the slide are not theories – but could its omission be a ‘telling’ statement on where academics are in Higher Education in relation to their understanding of learning in new landscapes of practice? The title of the introductory chapter in Etienne Wenger’s 1998 book is ‘A social theory of learning’ – not ‘A social learning theory’. Does this slight change in order of the words make a difference? I think it probably does. There was an interesting discussion at the Academic Betreat about the relationship between theory, practice and learning. Whilst theory, practice and learning are closely entwined, I came away from the BEtreat reminded that I have always used theory to ‘inform’ my existing practice, rather than use theory to ‘form’ my practice. This question of which comes first, theory or practice, has often been the subject of discussion in my teaching career and particularly when I was a teacher trainer. 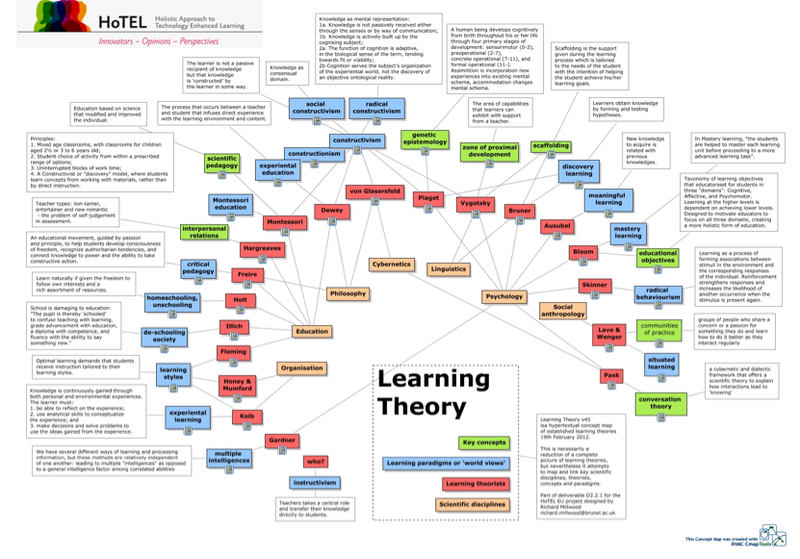 Should we teach trainee teachers about learning theories before we send them into school and let them loose on children, or should we send them into school and engage them in practice, before we introduce them to learning theories? If we believe that meaning making is grounded in practice and identity, which in turn is ongoing and never perfect, then the latter would be seem to be the better option. A social theory of learning is based on a belief that learning is social and is driven by meaningful membership of a community of practice. So another question that was raised in the Academic BEtreat was – is a school classroom a community of practice? This led to an interesting discussion. A school classroom is not a community of practice – it’s a piece of institutional design, a space in which a community of practice might grow. A school classroom and the school itself are landscapes of practice, within landscapes of practice, in the sense that communities of practice are people sharing their practice around an identified domain. Within a classroom there will be different communities of practice, and the school will be located within a landscape of different communities of practice. A classroom is a social learning space. Thinking of it like this, as a learning space within learning spaces, rather than questioning whether or not it is a community of practice leads us to think about what this learning space might offer and the teacher’s role in this. Will the teacher be able to motivate children to learning? Will the teacher create learning spaces for children with different learning styles? Will the teacher create a learning environment where children can discover themselves as learners? 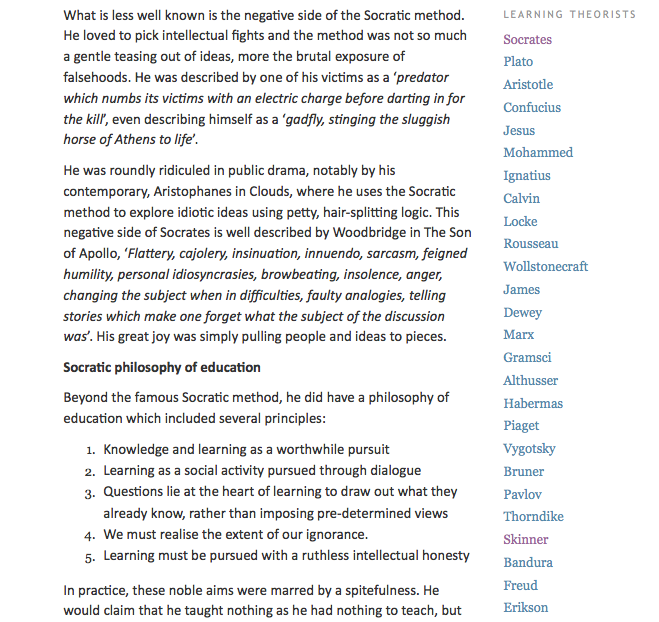 Teachers’ interventions will be different if they take on a social learning approach and will be affected by the other theories that they might ‘plug and play’ into the social theory of learning – such as motivation theory or learning styles which are not in the social theory of learning. A teacher’s intervention will also be affected by their role. ‘Role’ is not a technical term in the social theory of learning, but a given role does have an affect on identity and might even conflict with identity. ‘Role’ is a reified function. Reifying a role is not always a good thing as you then have to live up to the role. Reification is a powerful tool and like all powerful tools is a dangerous one. It is always a simplification. The problem arises when it takes over. The danger of reification is when it gets removed from the practice – a salutory message for teachers. I am still processing my Academic BEtreat experience and in doing this came across this recent video of Etienne speaking to PGCE students at Manchester University. It covers some of the ideas I have reported from BEtreat discussions in this and other posts. I am just back from a couple of days at a conference at Stirling University Scotland. As with all conferences for me – it’s difficult to come away and clearly articulate the conference’s value, or what I have learned, or been provoked into thinking about and exploring further (at least in the short term). And as with all conferences, I went to some sessions that ‘left me cold’, but to others which left me knowing that there is lots I need to think about further. The Stirling conference (overall) fulfilled the latter more than the former. I was introduced to lots of new ideas. Recently I wrote a post about being a glass half empty person . After this conference I realize that is not quite correct – but that my interest in learning is stimulated by ‘unlearning’ and by ‘unseeing’ – an idea further stimulated by a paper presented by Jason Thomas Wozniak, Teachers College, Colombia University, USA. I was lucky that this was the last session I attended, as for me it pulled together ideas from some of the other presentations that had been simmering in my depths somewhere and also related to our own papers in unexpected ways and particularly to the idea that what is not present is as important as what is present – which I first began to think about after reading a paper about 6 months ago by Terrence W. Deacon (2011). Wozniac’s work with learners in Brazil has sought to encourage learning through ‘making the world strange’. Paul Standish, another speaker at the conference, seemed to be aligned to this idea, albeit through different expression, when he urged us to ‘reclaim the concept of the amateur in a positive way’. I take this to mean that we have much to learn from the amateur and unexpected ways of thinking. Standish pointed out that teachers often close down dialogue and said that teachers need to learn how to be an authority without being in authority. Wozniac’s team attempted this with Brazilian learners, i.e. to encourage learning through unlearning and seeing through unseeing, through a series of exercises involving art, poetry and dialogue. This reminded me of when (years ago) I attended life drawing classes and for weeks we were not allowed to draw the figure as we saw her, but instead each week had to draw her from different perspectives, e.g. the figure as a mathematical representation, the figure as a landscape and so on. We, along with Wozniac’s adult teachers and students, were developing ‘negative capability’ (Keats 1935, p.72, quoted by Wozniac) . ‘That is to say that these teachers were ‘capable of being in uncertainties, mysteries, and doubts, without any irritable reaching after fact and reason” (Wozniac, 2012). This idea of promoting uncertainty and mystery in learning is very closely related to the work I have been doing with Roy Williams and Simone Gumtau on emergent and embodied learning ….. And it seems to me that a focus on uncertainty necessitates consideration of what is not there, or ‘The Other’. For Julie Allan (keynote speaker) this ‘Other’ was expressed as ‘Aporias’. She encouraged us to think in terms of expressions of doubt, e.g. How can we raise achievement and promote inclusiveness , or how can we promote autonomy and support collaboration (which seems very relevant to the FSLT12 MOOC ). Today’s the “urban” family and child has new classifications of “troubled youth” and “the dropout”. Without too much effort, it is easy to realize that there is no “troubled” or “dropout” without theories about the child who is not troubled and who is different from the child “drop-in”. According to Popkewitz you can’t understand the self without understanding ‘The Other” and trying to control the future has never worked. working with a school – Topcliffe Primary School – to explore how developing technologies can support children on the autism spectrum. At the same time, the way in which children on the autism spectrum learn in a responsive environment designed especially for them (MEDIATE) has featured as a case study in both the most recent research papers I have been working on with Roy Williams and Simone Gumtau. One – Synaesthesia and Embodied Learning has just been submitted to The Future of Theory in Education Conference, due to take place at Stirling University in June of this year. Williams, R., Gumtau, S. & Mackness, J. (2012) Synaesthesia and Embodied Learning. (Paper accepted for ‘Theorising Education 2012: The Future of Theory in Education: Traditions, Trends and Trajectories Conference which is taking place 7-9 June 2012, at University of Stirling). The second – a paper on complexity, learning environments and emergent learning – will be (fingers crossed) submitted within the next month, although we are also presenting a workshop (clinic) on this at the Stirling Conference. What has been interesting for me in all this work is to get a glimpse into how people on the autism spectrum learn and reflect on how this informs teaching and learning with other groups. There are some intriguing links and challenges. This is a question that was raised near the end of Tom Reeves very interesting presentation to ChangeMooc this week. The focus of Tom’s presentation was educational research and the lack of impact of educational technology research on educational policy and practice. 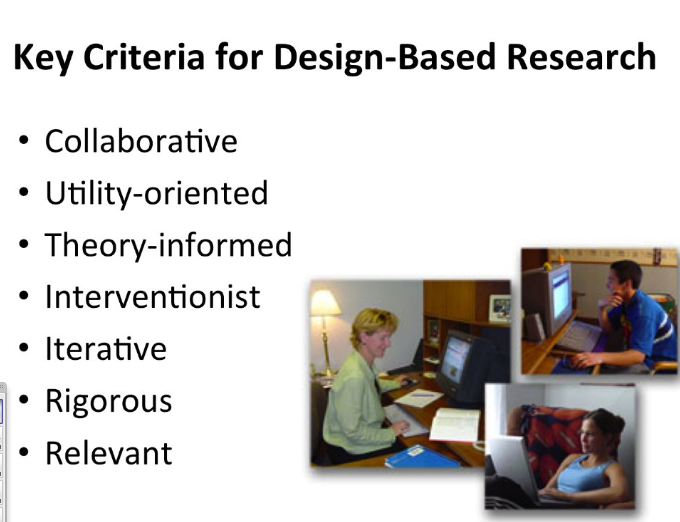 To address this problem he has worked with colleagues to develop a model – Design-Based Research. in which the focus is on researching a problem. None of these answers quite satisfies me and this dissatisfaction has led to some further thinking and discussion. Following a given model or a systematic process won’t necessarily lead to academic rigour or even reliable success. I was interested in Stephen Downes’ comment that he is more a follower of Feyerabend in being “Against Method” and that ‘there is great liberation in understanding that ‘method’ is based on sociological desire for conformity rather than scientific desire for truth’. 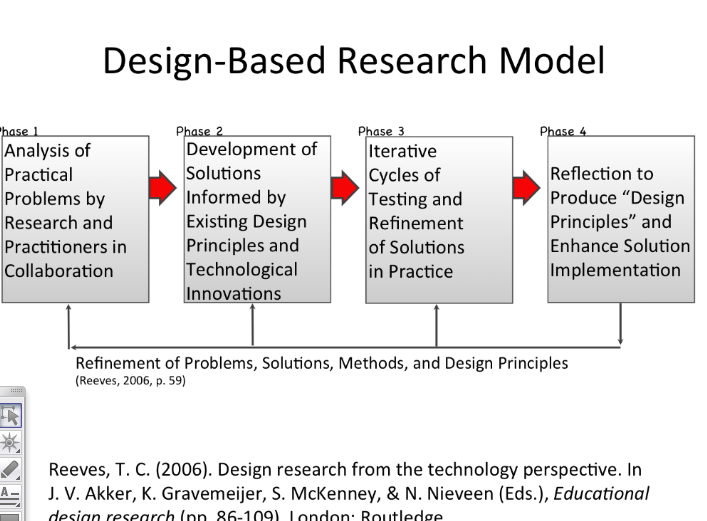 Finally, there was the question of whether or not research needs to start with a problem – the Design-Based Research Model states that it does …..
… but this wouldn’t account for ‘Eureka’, ‘Ah Ha’ moments or accidental findings . 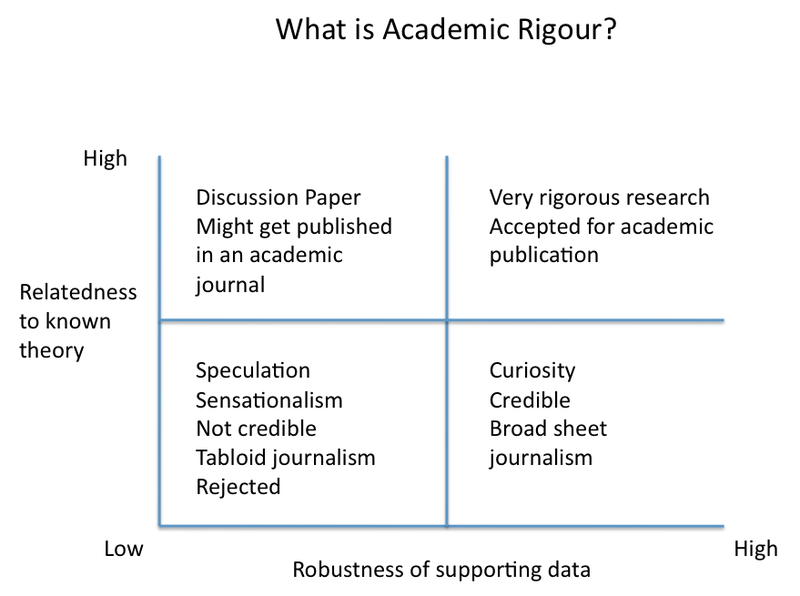 This would suggest that ‘academic rigour’ is not always needed for good research.